Hedge funds invest trillions of dollars. Many of them, especially the largest, are very successful. That means it’s important to watch what they buy and sell. In February, I told you hedge funds have bailed out of stocks before the sell-off. Well, now, these very same large investors are bullish again. The chart below shows the past four reversals in my “smart money” indicator. 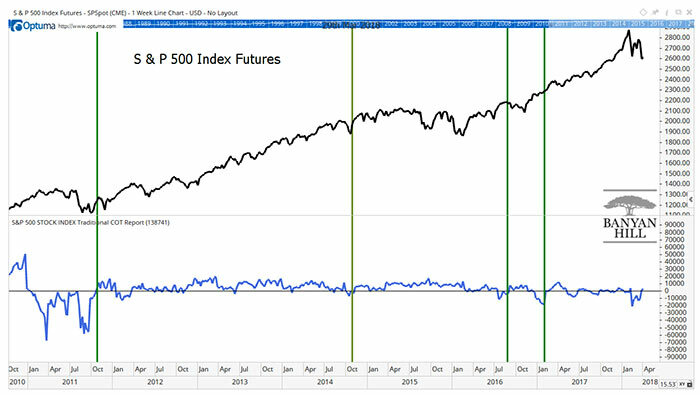 This is a chart of futures contracts on the S&P 500 Index. Each 1-point move in the index results in a gain or loss of $250 for each contract. The indicator in the chart uses data from the Commodity Futures Trading Commission’s Commitments of Traders (COT) report. That report details the positions of large speculators, which include hedge funds. It also provides data on individual investors and traders known as commercials, which include the largest investment banks. Weekly updates to the data show changes in the positions of each group. Tracking the changes can be profitable for traders. As a group, large investors tend to outperform small investors. In the chart, I converted the COT data to an index showing how this week’s data ranks relative to COT reports over the past five years. The thin gray horizontal line marks the difference between bullish and bearish positions. Last week, the hedge funds turned bullish. Vertical green lines mark previous transitions from a significant degree of bearishness to a bullish position. You see, the timing signals don’t catch the exact bottom. But the hedge funds turned bullish after the worst of the decline is over. Conservative investors want to wait for confirmation. That’s because, for now, all this data tells us is that hedge funds are no longer selling. But that’s important to know. When hedge funds are bullish, that relieves selling pressure in the stock market. Without selling pressure, a bottom can form. We aren’t back in a roaring bull market yet. But the COT data points to better days for bulls in the near future.